More than a modern-day success story, Joseph Eichler changed the face of American architecture by creating the ultimate, affordable family home. Now, nearly 50 years after the phenomenon of the Eichler home, once a quintessential symbol of the American Dream, this beautifully illustrated volume chronicles both the success and ultimate demise of a legendary company. 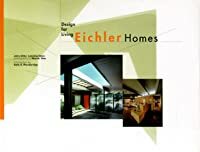 With over 100 full-color photographs of the homes' various models, as well as an introduction by architectural expert Sally B.
Woodbridge and an essay by Eichler's son Ned, Eichler Homes tells the poignant story of a unique post-war business, and of a singular vision and unforgettable legacy that continue to inspire architects and designers around the world.